No matter how many hosts or devices are connected together, if they are connected with a repeater, hub, switch or bridge, all these devices are in ONE Broadcast domain (assuming a single VLAN). A Router is used to separate Broadcast-Domains (we could also call them Subnets – or call them VLANs). So, if a router stands between all these devices, we have TWO broadcast domains. 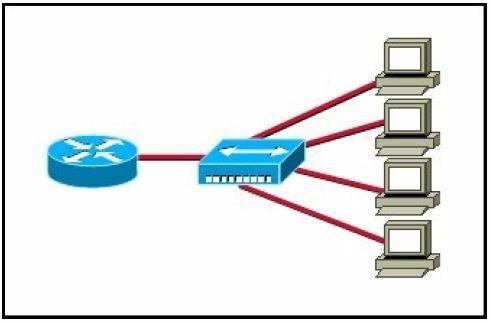 Each connection from a single PC to a Layer 2 switch is ONE Collision domain. For example, if 5 PCs are connected with separate cables to a switch, we have 5 Collision domains. If this switch is connected to another switch or a router, we have one collision domain more. If 5 Devices are connected to a Hub, this is ONE Collision Domain. Each device that is connected to a Layer 1 device (repeater, hub) will reside in ONE single collision domain.